For those of you over 21, we have found a pretty cool new Twilight tie-in. 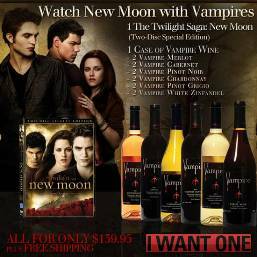 Vampire Vineyards is marketing a wine package that includes a copy of the New Moon DVD and 12 bottles of Vampire Wine. Already have the DVD? You can also buy the Vampire Wine separately including Merlot, Cabernet, Pinot Noir, Chardonnay, Pinot Grigio, and White Zinfandel. For those of you under 21, they have an interesting collection of vampire fangs, vampire coffee, and vampire chocolate. Their Vampire Fine Belgian Chocolate comes in both milk and dark chocolate. If you know anyone who is a big Twilight fan who has everything, this would make a perfect gift! Check out Wicked Wines Online for more information.